“Go to Prague and Czech Republic” discovered the food, local sites, and fine hotels in the capital city of the Czech Republic. The stay at Prague got everyone on the local clock, plus we had a fascinating day trip to Melnik and the Lobkowitz Castle with its antique furnishings, restaurant luncheon of wild boar with dumplings, and wine tasting. 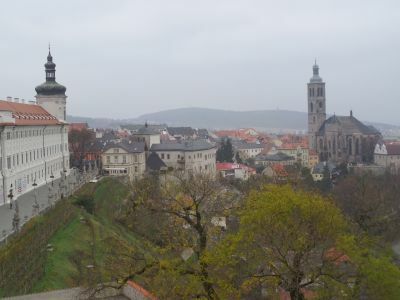 This current article continues the adventure, transitioning through Kutna Hora and on to Brno in the southern part of the country. Kutna Hora is a UNESCO World Heritage Site and is the filming location of numerous motion pictures. 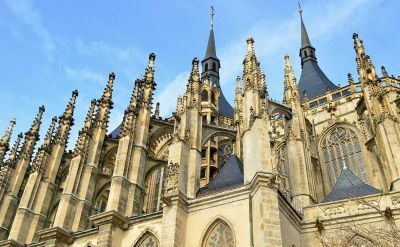 Its St. Barbara’s Church is visible throughout the area and a special treat was taking a walk along the roof edge, amongst the Renaissance Gothic spires and gargoyles. Inside the church are preserved fresco art and beautiful clerestory windows. As a silver producing area, much of the decorations exhibit the toil by miners and local life. The church completion was a half-millennium long project due to a lack of funds after the silver mines petered out. It was necessary to reduce the footprint, delay features outside of the core nave, and end the effort in 1905. From the balcony, above the church nave, a door leads out to the roof area for viewing the multiple Gothic themes. 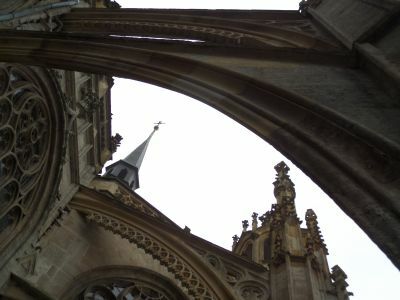 The classical architecture on the roof is skeletal and open, with arches extending up towards the spires, which appear as if shooting up to touch heaven. This was architectural education up close, but then, ever watchful, are the gargoyles at the roof edges. Spires you can see best from afar, but gargoyles need to be spoken to. 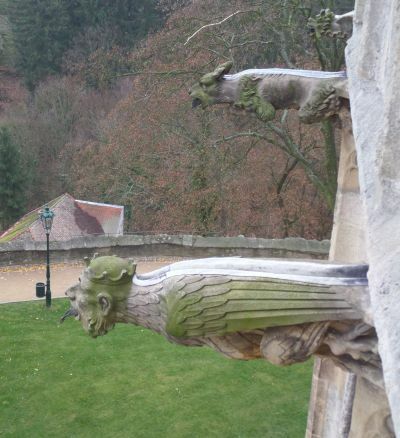 Walking on such a narrow rooftop pathway meant keeping an eye on the gargoyles. Getting up close and personal, you can see there are others that care for them. Along the inside of the water runoff trough is a modern heating element to keep the ice cleared out. It is frightening to think that in earlier times, a person had to go up there and clear the ice to avoid damage to the roof. 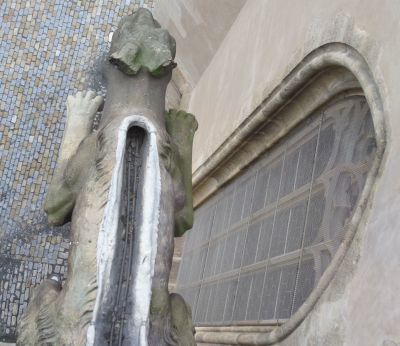 Can you trust a gargoyle that much, reaching out from the relative safety of a roof edge, to brush its back? Italian Court in Kunta Hora includes the Royal Mint of the late Middle Ages and Renaissance periods, when the Bohemian silver coin was currency throughout Europe. Exhibits of coins and actual coin stamping causes one to imagine a life spent swinging a hammer, every day and all day – and we complain about repetitive stress due to computer typing! In the chapel at Italian Court is a beautiful statue of Christ. 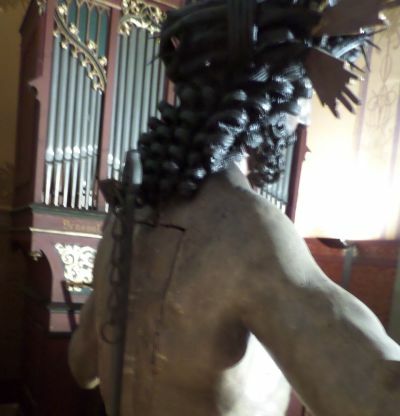 Interesting is the “vault” cut into the back of the statue where jewels could be hidden from invaders or thieves, none of whom would violate the sanctity of the holy image. Certainly, everything else in the building was fair game and the hiding place apparently worked. Recommended is a meal at Restaurant Dacický in Kutna Hora at the Italian Chapel. Served daily are old Bohemian recipes and six types of draught beer or local wine. Nearby in Sedlec is the bone chapel, a real ossuary, displaying bones of people who died from the plagues sweeping through Europe. This is somewhat creepy, but it remembers the monumental numbers of deaths and in public squares, as in Brno, are monuments to the dead. We are connected to these people not only through family DNA, but also in reverence displayed with the Vietnam Memorial, and the more recent 9/11 Memorial. Wine tasting in the region Moravia is next in this three-part written tour of Czech Republic. Gateway to the region is the city of Brno, second only to Prague in population. A wonderful hotel in Brno is the Hotel Barcelo Palace. It is located at the base of the Petrov Hill, where the Gothic-styled Cathedral of Saints Peter and Paul is located. This historic ground is at the center of the city and important in the battles saving the region during Thirty Years War of the 1600’s. Several days can be dedicated to visit Brno, which boasts a UNESCO listed must-see Functionalist Villa Tugendhat. Finally, ever wonder: Where do they get all this wild boar? Wild boar and dumplings was served everywhere as the representative of Czech cultural dining. The answer is in the forests and wooded areas of central Czech, right next to the wine tasting we do in the next article. Hunters and shooters, lured into tours that actually lead to shopping malls, take heart. We show you how to arrange for a personal wild boar hunt experience. These animals are big, so take a breath, exhale slowly, and squeeze the trigger while its tusks turn towards you. If you miss, then perhaps shopping wasn’t so bad, after all. 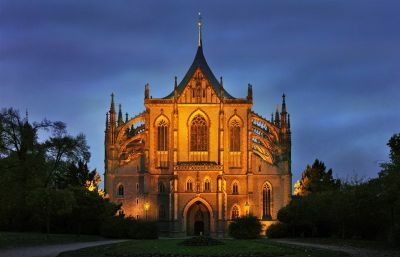 To read the Luxe Beat Magazine version of this article click on the title GO TO KUTNA HORA AND CZECH REPUBLIC – PART 2. I have been there many times…and never ceased to be amazed at the beauty of this place. St. Barbera’s Cathedral is one of the finest in Europe. The inside is breathtaking. The gardens with the cherry trees on the terraces below are also beautiful in the spring. It ranks as on of my all time favorite places in Europe.